Although the opening ceremony was billed as the largest show Vancouver had ever produced, the true highlight for many people was the Royal Visit. 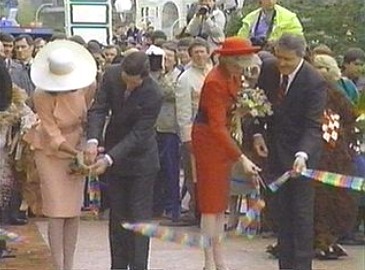 Prince Charles and Princess Diana began their tour with a ribbon cutting ceremony at the Canada Pavilion. After a rest and a change of clothes, they were escorted by yacht around Stanley Park for a waterfront tour of the city to the main Expo site. A formal welcome followed at Expo Centre. 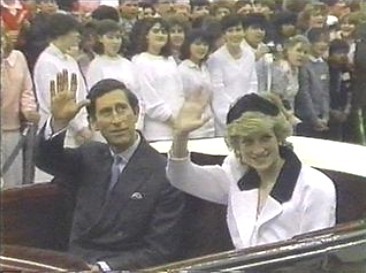 Along with Canadian Prime Minister Brian Mulroney and his wife Mila, Charles and Diana visited several pavilions. "I bring you the greetings of Her Majesty the Queen who sends her very best wishes to her Canadian Subjects. . . . . . Expo's theme of transportation and communications are fitting and appropriate to this Province which is itself so much larger than the whole of the United Kingdom and also to Canada the second largest Country in the world. . . . . .So Ladies and Gentlemen, together with my wife, we have the greatest pleasure in declaring Expo '86 officially open." Opening day was an emotional event for many people. After seven years of planning and three and a half years of construction, it was a relief to finally see the day come.